Rats and mice give me the heebie jeebies, but their tree dwelling cousins the squirrels are just too danged cute with their fluffy tails. It's funny how a different wardrobe, so to speak, makes all the difference in my perception. 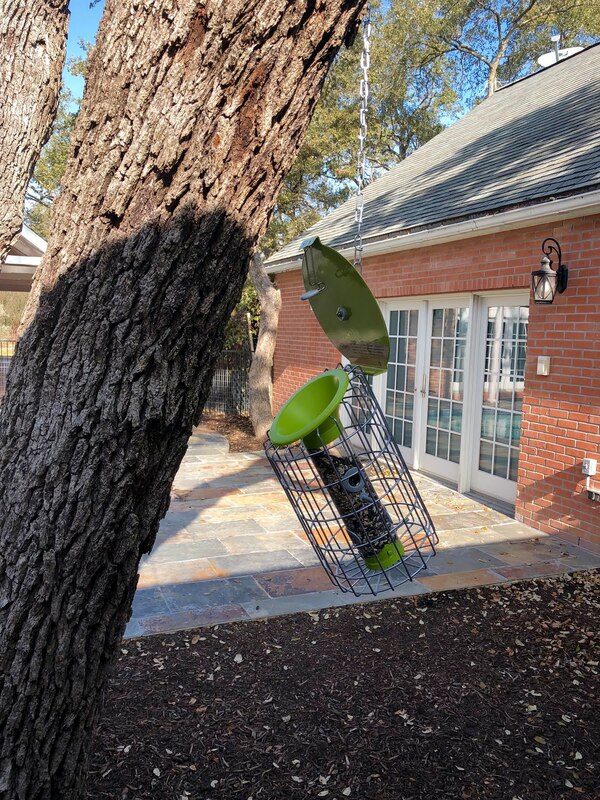 So yeah, they're cute and funny to watch until they start squirrel-handling the "squirrel proof" feeder, to the point where the top pops open and it's a birdseed all you can eat buffet for the little thieves. This is how I found it yesterday morning after I had filled it up late in the afternoon the day before. Too bad for the squirrels that I'm equally stubborn and persistent, so I employed a zip tie to keep our resident overfed squirrels from rattling the feeder until it falls open again. It's times like this when I wish I had a game camera so I could watch their antics as they try to break into it again. Hopefully the little buggers don't figure out they can use their sharp teeth on the zip tie to gain access to yet another free meal.